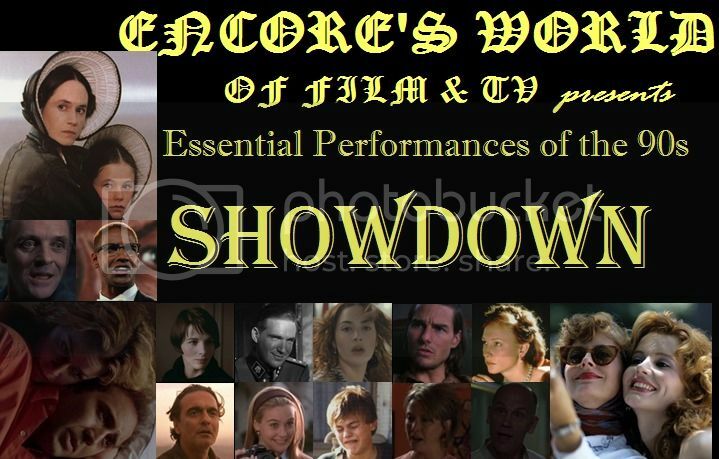 Continuing the first round of voting for the Essential Performances of the 90s Showdown, I've got two more games for you to vote on. Currently, four other games are still open for you to vote on. The Jodie Foster / Dustin Hoffman and Anthony Hopkins / Reese Witherspoon match-up HERE and the Julianne Moore / Woody Harrelson and Nicolas Cage / Irene Jacob HERE. The complete bracket is HERE. Information on the rules is HERE. If you're interested in spreading the word, the banner is HERE. Games 5 and 6 below are open for voting until Wednesday morning. The late Nineties saw a spate of films about white collar drones rebelling against the drudgery of a 9 to 5 existence, wreaking havoc along the way, titles like American Beauty, Office Space and Fight Club. In a number of these movies the guys get to have all the fun while the ladies are an afterthought. This is not the case with American Beauty’s Carolyn Burnham. Annette Bening is no film’s afterthought. In less skilled hands the character of Carolyn could have easily degenerated into caricature. The screenplay certainly doesn’t hold back the unpleasant character beats, from her raging materialism to her passive-aggressive mothering to her power-of-positive-thinking pep talks that devolve into screaming self-abuse in the face of failure. Luckily for the film, Annette Bening is constitutionally incapable of delivering an inauthentic moment. She elevates Carolyn into the tragic flip side of Spacey’s journey. Where Lester Burnham lets go of everything until he achieves a sort of transcendence by film’s end, Carolyn clings to control with white knuckles until she finds she has nothing left. I think it’s fair to say that without Bening on hand to lend her character heart and believability one of the biggest films of the nineties would not have had nearly the impact it did. Sandwiched between Sean Penn’s intense work in stuff like Dead Man Walking and Mystic River his gloriously goofy performance as Emmet Ray in Woody Allen’s Sweet and Lowdown seems glaringly out of place. But then again, it is difficult to imagine a list of performances on which it would look at home. Penn’s work as Ray is one of the wholly original performance of the Nineties. “Not only are you vain and egotistical, but you have genuine crudeness,” effuses Uma Thurman’s Blanche upon catching Sean Penn’s Emmet Ray in the act of stealing a trinket from a swanky party for no good reason. We understand her delight. For all his repellent qualities Ray is a fascinating creature. A jazz guitar genius, Ray has the soul of a great artist buried beneath the surface of a world-class creep. One moment he moves you to tears with his sublime playing and the next he’s taking his date down to the dump to shoot rats. Amazingly, Penn somehow succeeds in making us care about this absurd person. The film’s closing scenes where it belatedly dawns on him that his rampant self-regard has led him to fritter away the love of his life are quietly devastating. So consider this before you dismiss Sweet and Lowdown as an amusing trifle: Penn’s work here could very well represent the greatest performance of the greatest actor of his generation. The Big Lebowski is a decidedly defiant, outré, weird movie – even within the context of the Coen Brothers films. The Dude, whom Bridges is required to play, is as weird as the film and, I suspect, poses difficulty to the performer. But Bridges, very in touch with the hazily created specimen renders the character more expertly than you’d expect. There’s a scene in the film when The Dude pays a visit to the eponymous “Big” Lebowski. Mistaken identities have proved hazardous for the former and he’s not too pleased, especially when the latter meets him with superciliousness. The entire scene plays out as an encapsulation of Bridges performance in the entire film. There is the physical aspect of this indolent, to the point of inactive, man whose posture in a chair tells us so much about it. Then, there’s the drawling tone which complements his lazed physicality. Both his voice and his body seem at odds with the complaint he is making because the kicked-back state of hazy nirvana which The Dude exists in prevents emotion from being telegraphed in the usual ways. It is, then, to Bridges great credit watching him navigate through bafflement at the position he’s been put in, placid annoyance at it and then a general disinterest in how it turns out either way. Because The Dude is so mellow there’s a potent danger of his every movement coming across as vague, but Bridges – an inherently more energetic performer than the role – manages to mute his natural cadence making The Dude placid but never lethargic. It’s a tough mountain to climb, but he scales it with ease. When, in the final fifteen minutes of The Wings of the Dove, Kate Croy becomes something of a secondary character in what had previously seemed to be her own tale one might still find themselves craning their neck trying to find Helena Bonham Carter’s expressive face. It elucidates a key difference between Henry James novel and Ian Softley’s adaptation. With almost 500 pages at his disposal, James novel fails, or does not even try, to make Kate Croy a fully rounded character which makes Bonham Carter’s task in the film adaptation doubly hard. The film itself is only ninety minutes and she has a paucity of time to wheedle the viewer into understanding how this plot to dupe a dying American heiress of her money for an imaginary love could be acceptable. She must do this whilst also making am indelible impression on us so that when the film leaves her for that chunk near the end we still remember her despite her indiscretions. She does both with aplomb. Helena is navigating through so many shades of Kate – many of them unsavoury – and she does a delightful thing where she doesn’t make the more indiscreet elements of her persona removed from the more admirable. She is unafraid to be as sincerely tender to the girl she dupes as she is to her lover thereby forcing our hand into accepting her flawed sense of purpose and the sad desperation within her ostensible harshness, forcing us reassess our feelings on money and love so that before we even have time to realise that we could – or should? – be censuring her we’re already mourning the loss of her innocence and hope. Bening's frigid wife or Penn's easy musician? Bridges laidback Dude or Bonham Carter's decisive social climber? Vote for your favourite (and spread the word). Not a big fan of Penn so this is an easy one. Plus I thought it was a bravura performance that Annette did in American Beauty. I can't remember who I voted for but I prefer Sean over Annette. Both performances are to the hilt but Sean's is just surreal in a good way.